This campground fire ring makes outdoor campfires safe while providing a large grill surface of outdoor cooking. Features a 300 sq. in. cooking grate that is adjustable to 4 positions with cool spring handles. The 15 x 20 inch grate is made of 1/2 inch steel rods welded on 1 inch centers. 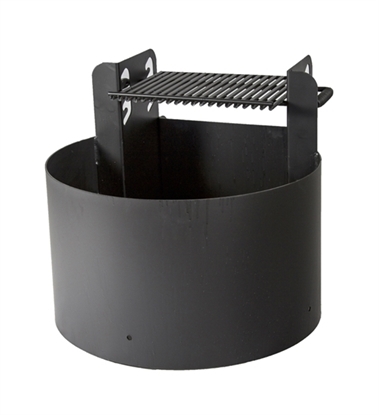 The 6 inch high fire ring is made of 3/16 inch thick steel and is 31 x 34 inch with a reinforcing angle across the pit. With spade anchor stakes for mounting into the ground. The unit is painted with a non-toxic, heat and rust-resistant black enamel.